According to the leaked documents, the Note 5 will get the new firmware next month, Galaxy S6 in January, but Samsung has no plans to update the Galaxy S4. Android 6.0 Marshmallow updates will begin showing up next month for most major brands and Samsung is no exception to that, despite the existence of its custom TouchWiz UI that needs to be updated as well. A recently leaked Android update roadmap document shows that the company's most notorious handsets are scheduled to get the update by the end of January, although others will not get an official firmware based on Android 6.0 at all. The latest Android 6.0 Marshmallow update roadmap leaked online last week and, although there is no official confirmation of the data in it, things look as anticipated. 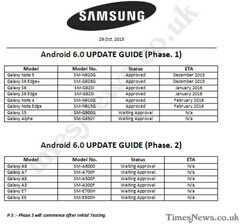 Samsung has decided to update the most recent devices first, leaving older ones for January and even February. On the other hand, older ones have been left out, so their users will have to get unofficial Android 6.0 ROMs or remain with Lollipop for the rest of the time they will spend with their devices. For now, it looks like Note 5 will get updated next month, followed by Galaxy S6, Galaxy S6 Edge, and Galaxy S6 Edge+ - all to get Android 6.0 Marshmallow in January. 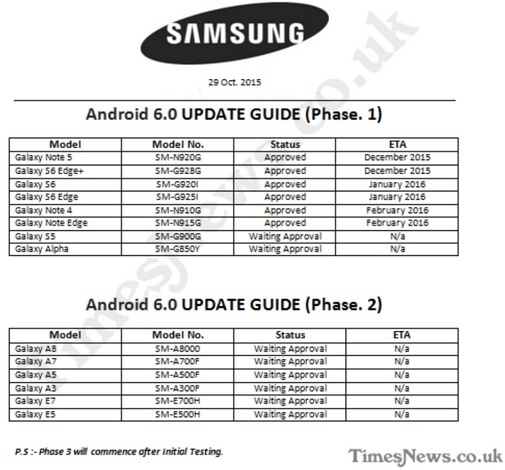 Samsung Note 4 and Note Edge are expected to get the Android 6.0-based firmware in February. Fortunately, it does not stop here, although some users will have to wait a lot - Galaxy A8 is scheduled for March while Galaxy S5 will get Android M in April if everything goes according to plan. At last, it is worth mentioning that Galaxy S4 and Note 3 are not expected to get Android 6.0 via the official channels.